Pontiac offered performance automobiles that are known worldwide for top quality. EZSofttops offers Pontiac convertible tops based on the original Pontiac convertible top patterns. Each of our Pontiac convertible tops is manufactured to original pattern specifications and we offer the original fabric selection. 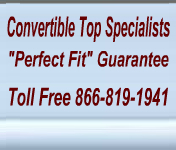 Our replacement Pontiac convertible tops are available for the Pontiac Bonneville convertible top, Pontiac Catalina convertible top, Pontiac Grand Prix convertible top, Pontiac Firebird convertible top, Pontiac GTO convertible top and the Pontiac LeMans convertible top. We offer also a complete line of Pontiac convertible top parts including Pontiac convertible top boots, Pontiac convertible top pads, Pontiac convertible top cables and Pontiac convertible top headliners.